FolkAlley.com is listener supported and relies on donations and sponsorships to fund the web site and the music streams. Folk Music is disappearing from radio playlists and store shelves. Folk Alley aims to reverse this trend by bringing traditional, Celtic, bluegrass, Americana, singer/songwriter, acoustic and world styles to music lovers – young and old – around the globe through the Internet. Click Here to make a donation today. 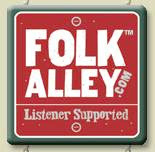 Yes, Folk Alley is a bit of a treasure and deserves our support. I should add that his has absolutely nothing to do with the fact that they just selected me as their Open Mic Artist of the Month.